Some of the cars we receive are like an old song waiting to be rediscovered. All it takes it the right owner and a proper refresh to give it the power and vitality it once had. This 1971 Porsche 911T is one such car. Its Metallic Green color carries the patina of a bygone era, and yet, much of what was, is still there, including its original, 2.2-liter flat-six engine, all-leather interior, and original set of Fuchs wheels. This classic 911 Targa was driven by its one and only owner until 1984. Then, it was parked and stored in the garage of his Florida home - its extensive maintenance records filed away. Fast-forward to 2016, when we purchased it, and had it serviced. Even at 68,000 miles, it remains an exceptional example of the open-air species: a classic 911 Targa that’s an ideal candidate for a concours restoration. Close inspection indicates it has never been in an accident, it shows no signs of rust, and it was coddled and cared for throughout the years. Once its restoration is commissioned, this classic 911 will undergo our rigorous process, fully documented with photos and video. 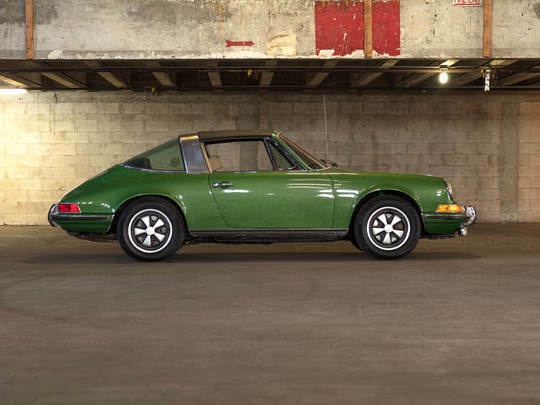 Ready to return this 1971 Porsche 911T to period-correct perfection? Please fill out the form below or contact us. We’d love to work on this project with you!